Okay, so I've been very distracted from this site, but I'm as usual planning more updates. This first round is a bunch of pictures in the gallery! Head there now! So where to do we begin. Tom is going to the beach minding his own business when Tyke comes along and barks at the unsuspecting Tom. This introduces the running gag of Tom flipping out anytime a dog barks at him. After Tom calms down we are then introduced to Jerry who is also at the beach. Jerry sets up his spot unbeknownst to Tom who sets up his beach spot right in Jerry's sun. Well, Jerry is having none of that and decides to poke Tom with a sharp object thus setting up the rivalry and the back and forth battles with each other. Jerry is kind of a jerk in this instance. During the ensuing chase we meet up with Johnny Quest and his pals. Bandit freaks out Tom with his barking and Johnny apologizes right before these new pals are attacked by three flying Hench cats that seem to be rather familiar (*see Tom and Jerry Meet Sherlock Holmes). Poor Tom, he's just wanting to mind his business. The Hench cats begin chasing Quest and our duo when Tom is startled by Bandit's barking again. This barking causes Tom to freak out and become this ultimate fighting machine that takes out the Hench cats. This bit with Tom freaking out reminds me of the old Three Stooges short where Curly becomes this unstoppable force when "Three Blind Mice" is played...am I showing my age here...yeesh! Anyway, Quest and our duo make their escape with the help of Race Bannon. After the get away we are introduced to the villain, Dr. Zin (voiced by the awesome James Hong) and the Hench cats and find out his plans to capture Dr. Quest, which if I recall correctly was the premise of every Johnny Quest cartoon. I already have a beef with the Hench cats because they introduce one of them as are "Rainman" type and I just can't stand that cliche'. Really like how they updated the original Johnny Quest intro to include Tom and Jerry. Very fun sequence, would love to have seen an entire episode done that way. After this we end up in Quest labs and find out why Dr. Zin is wanting Dr. Quest. Dr. Quest shows off his latest invention, a Q-sphere that can solve the world's energy crisis and the thing that Dr. Zin is most likely after for some nefarious purpose. A couple mishaps at Tom's expense and we are off to dinner. Unfortunately, a very hungry Tom is given a skimpy dinner, which causes him to be Hangry. In the middle of the night, hungry Tom gets up and futzes with some buttons by a door so that he can get something to eat and inadvertently such the security system down. This leaves the lab vulnerable to an attack from the Hench cats. The Hench cats arrive while Tom is trying desperately to eat something while Jerry is preventing him from doing so. The cats and mouse begin to fight in the lab. The commotion gets the attention of Quest and gang but the Hench cats get away with the Sphere, Dr. Quest, and Race. 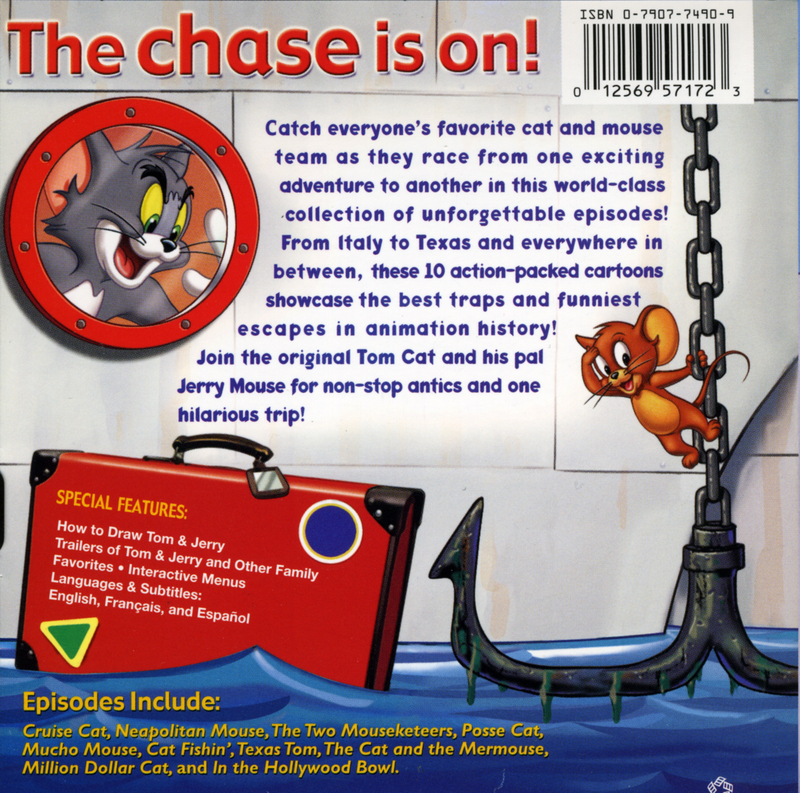 Now the kids and Tom and Jerry make plans to rescue Dr. Quest, Race, and the Q-sphere. The adventure begins. Off the gang races to find Dr. Quest, cut to the Dr. Zin's lair and I have no words for how bad this bit of villain and Hench cats are so I'll move on. The Quest jet is on the way and are attacked by Robot Drone Missiles, Tom freaks out a bit from Bandit's barking, ugh. The Jet crashes and they all make it out safely and land in Moldovistan. The heroes make it to town where they are chased by goons and rescued by Race's old flame, Jezebel Jade a mercenary/club owner. They go to Jade's club, where a belly dancer is on stage performing, and strike a deal for her helping our heroes. Off the heroes go in Jade's hovercraft while Jade goes on stage to perform. GAH! Droppy is singing! SINGING!!! WHY, WB? WHY!...sigh...so during Jade's song, the goons are thwarted and our heroes escape to Dr. Zin's lair only to get caught be Dr. Zin. Okay, I love the fact that Dr. Zin's lair is in a volcano. 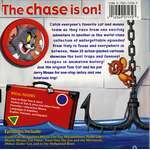 So Tom and Jerry have managed not to get themselves captured, while Quest and crew have. Dr. Quest is forced to set up the Q Sphere in Dr. Zin's volcano that seems to be a "Battle Island" that can fly. 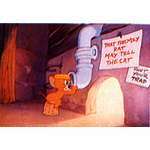 Back in the dungeon, Bandit is levitated by Hadji to a vent where his going to find Tom and Jerry. I can see the barking coming into play for Tom at some point. Okay, we have some exposition about Race and Jade, Dr. Zin and Dr. Quest's back story right before the Q Sphere is activated and the island rises in the air and flies straight to Washington, D.C. As the island flies toward its destination, the heroes escape from captivity and try to foil Dr. Zin's plans. What follows is lots of chasing and fights. Tom ends up using his freak out from dog barks to lay waste robots, Hench cats and eventually Dr. Zin. However, Dr. Zin manages to escape. The Dr. Quest eventually takes out the flying volcano island with a convenient missile that was hiding under the Washington Monument. However, our heroes can't make it off the island, but they get rescued by Jade and Droopy (who was keeping a watchful, distant eye on our heroes) and everything is back to better now. Our heroes get a medal from the President, voiced by the original Johnny Quest. The Good: I'm afraid that I really don't have much good to say about this latest Tom and Jerry meets someone. I've watched this movie twice now and I can't find much to like about it except for the really nice beginning credits. I wish this whole movie was animated like the opening title sequence as the animation was raw and energetic. A great throwback to animation of old. I'm convinced that it was a play on the old opening sequence from the original Johnny Quest cartoons. The only other good thing that I could say about it was the comment the President made when the Washington Monument missile launched. That got a great big chuckle out of me. The President, in the Oval office, looks out to see the Washington Monument lift off and says to his people, "Why wasn't I told about this?". It was delivered in such a deadpan way that it was funny to me. The Bad: Le sigh....where to begin. The animation was really jerky and too exaggerated at times. 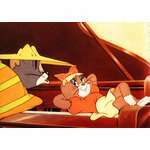 It didn't feel consistent to me and it wasn't smooth like what I think of with Tom and Jerry cartoons. 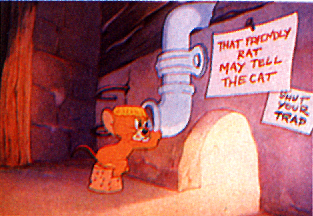 I couldn't put my finger on why until after the second viewing when I finally realized that this Tom and Jerry Spy Quest is really more of a Johnny Quest movie guest staring Tom and Jerry. 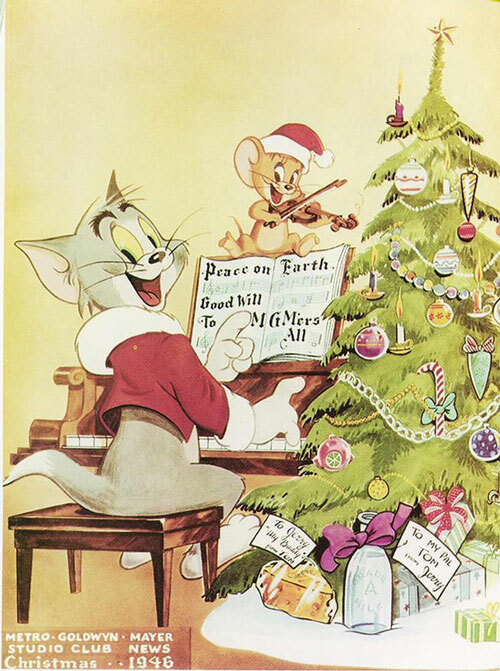 Unlike some of the previous outings with Tom and Jerry the cartoon's theme's were of a younger audience, within the first 8 minutes you could definitely tell this was for a much older audience. Particularly the sand mermaid scene with Tom and the dance number with Jade *shudder*. Hence my saying this is more of a Johnny Quest movie than Tom and Jerry. Dr. Zin. I don't watch much Johnny Quest so I'm not really familiar with his character, but a caricature like that character in 2015 should probably raise an eyebrow or two....moving on. 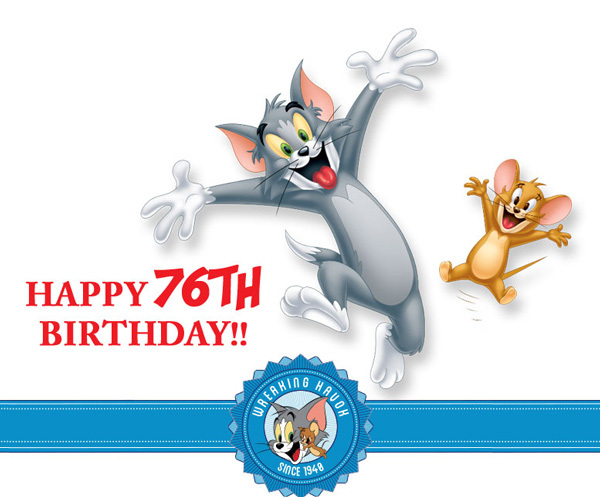 Jerry is kind of a real jerk to Tom in this one. 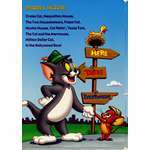 Tom wasn't paying much attention when he covered Jerry's beach spot, which set Jerry off to attack Tom. 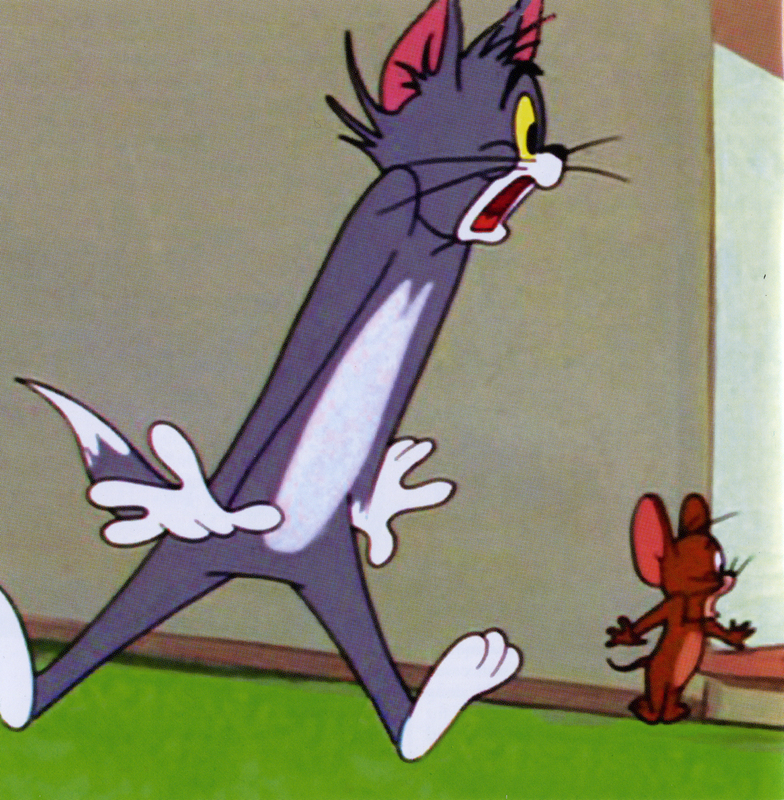 So a simple mistake pretty much ruined Tom's day with Jerry decided that Tom's his new hobby. 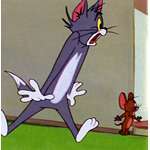 Every time Tom tries to eat or get away, Jerry is always there to starve him or put Tom in harms way. It got old after awhile. Gah, the tired cliche of some goon as the Dustin Hoffman "Rainman" character. Please, stop with this character. It's overdone. 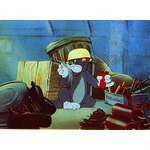 The Ugly: Okay...Why is Tom such a sniveling scared cat that turns into this berserker fighter when a dog barks at him. Seriously! Any time a dog barks, and there is always some dog that barks at him, Tom is triggered into this blind, hysterical rage. It's played for laughs more often than not and it comes in handy rather conveniently in spots. The worst offense is when Tom is trying to get the courage to fight the Hench cats at the end, but can't do it unless a reluctant, confused Bandit barks at him. WTF! 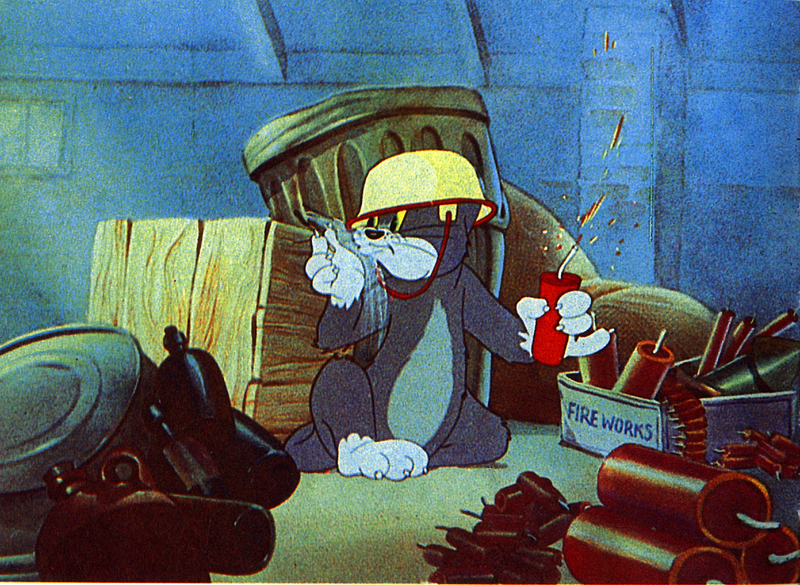 Why must Droopy always make a cameo in a Tom and Jerry movie? Some please explain this to me? I've come to loathe seeing Droopy in any of these recent cartoons. Don't get me wrong here, I LOVED the original Droopy cartoons when they were done by TEX AVERY, separate from Tom and Jerry. 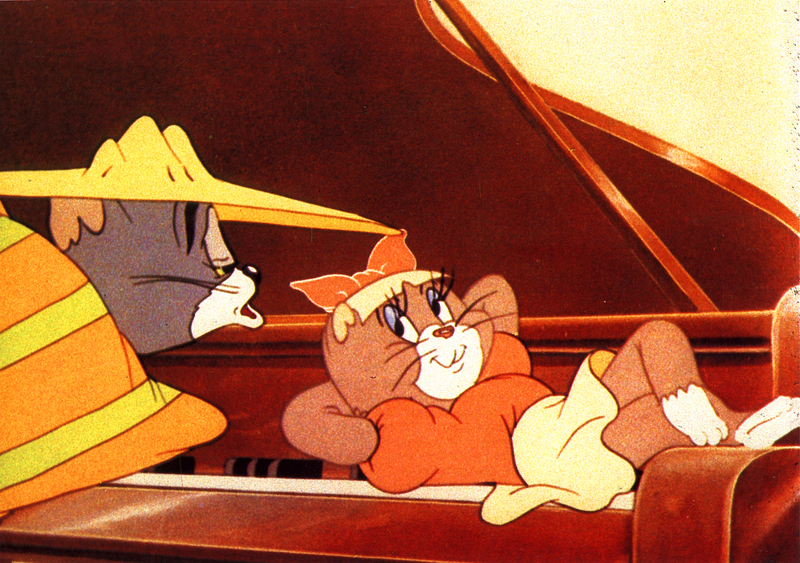 These Droopy cameos are a taint from the Tom and Jerry Kids cartoon era, it's the only explanation I have for why he keeps showing up in Tom and Jerry movies. And another thing: Droopy singing! It was awful...terrible...it was part of the Jezebel Jade number which was ridiculous in and of itself and certainly not for kids under 12. 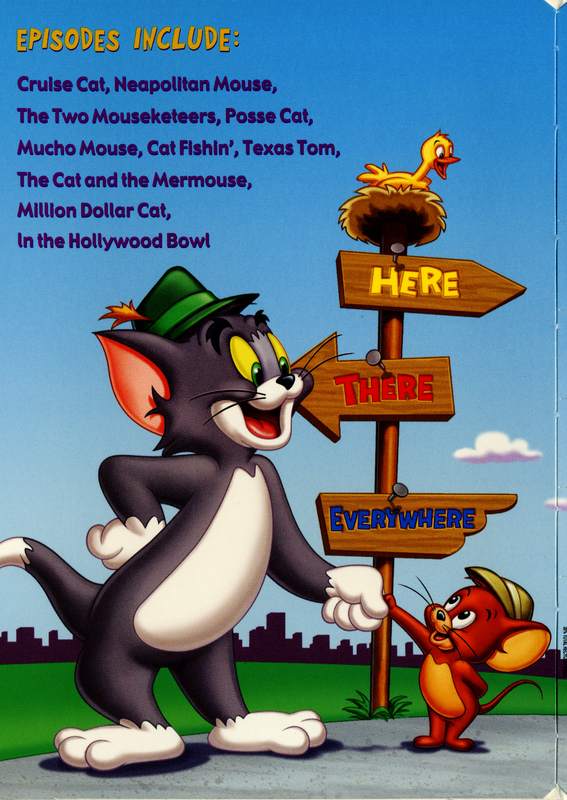 Totally out of place for a Tom and Jerry cartoon. Overall, this wasn't bad for a Johnny Quest movie, but this was a terrible Tom and Jerry film. It's definitely for older kids who like Johnny Quest. I'm not a huge Johnny Quest fan, I watched a few cartoons here and there over the years and never got into it. As a Tom and Jerry cartoon it was lacking. 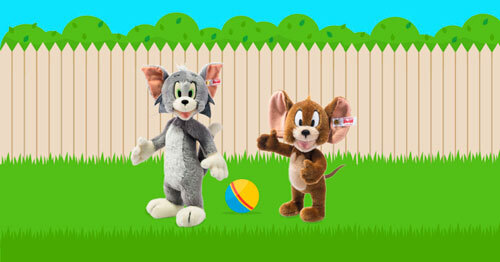 Jerry is an aggressive mouse that's really abusive to Tom and Tom is kind of a complacent punching bag that just wanted to mind his own business.